*Attractive colors and durable quality, these are the attributes that have made our range of decorative festive accessories. 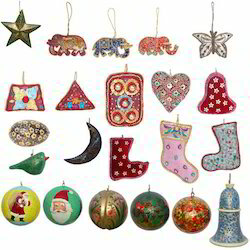 The array of decorative Christmas ornaments, Christmas balls, Christmas tassels available in various, stylish and traditional designs. With our in-depth knowledge and experience in this industry, we are the leading manufacturer, Eporting, wholesaler and supplier of Christmas Hangings. Painted smooth white on the surface with distress finish edges, these sturdy pieces can be used year after year. Our offered christmas hangings are made of MDF wood and carved in beautiful shape makes for classy christmas decoration. Hang them just like that for a clean white look or let the children paint on them or decorate them with glitter. Looking for Christmas Balls ?